4Media ISO Burner can burn ISO to CD, burn ISO to DVD disc accurately at the fastest speed. This smart ISO burning software also supports burning CD/DVD from other image file formats including BIN/CUE, IMG, MDF, NRG, CDI, B5i, B6i, DMG, etc. 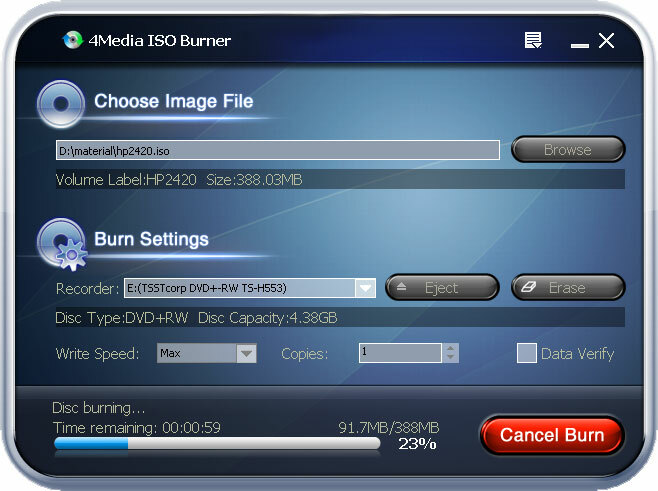 You can not only burn ISO to CD/burn ISO to DVD disc, but also burn CD/DVD from other image files like BIN/CUE, IMG, MDF, NRG, CDI, B5i, B6i, DMG, etc. effortlessly.This ISO burning supports CD-R, CD-RW, etc. To guarantee the accuracy and usability of the burned CD/DVD disc, the ISO DVD burner/CD burner helps you verify the written data in the way of comparing burned data with original data after burning. Free download 4Media ISO Burner and backup your image files to CD/DVD disc fast and easily from now on. * Erase disc data - Once you insert rewritable disc with data, the ISO burning software will detect it automatically and help you erase disc data if you want. It can burn CD from almost all video and audio easily and fast. Qweas is providing links to 4Media ISO Burner 2012 as a courtesy, and makes no representations regarding 4Media ISO Burner or any other applications or any information related thereto. Any questions, complaints or claims regarding this application 4Media ISO Burner 2012 must be directed to the appropriate software vendor. You may click the publisher link of 4Media ISO Burner on the top of this page to get more details about the vendor.